Google is well known for searching the Web, but the Google Maps (still in the testing stages - beta) might be the coolest thing they have introduced in quite some time. I have almost forgotten about Mapquest. I have published this Web site to provide a place for useful information to my friends and colleagues. Hentzenwerke Publishing has printed copieds (as well as downloadable E-Books in PDF format) of What's New In Nine: Visual FoxPro's Latest Hits. Have you heard that Visual FoxPro 9 was released by the end of 2004? Have you purchased the latest version and been trying to figure out all the new features? Want a head start to understand all that is new from developers who have been working with the product for more than a two years? All the chapters were posted electronically before the book and VFP 9 were released so you could have learned about the many new features in advance. Check out all the nitty-gritty details about the new Report Designer, the XML features, enhancements to many of the IDE tools including the new Data Explorer, SQL enhancements, new data types, customizable property sheet, hooks to redefine the native IDE dialogs, Anchoring, better IntelliSense, stronger remote data integration, the usual improvements to the language, a new version of InstallShield Express, and much, much more. Hentzenwerke Publishing has printed copies (as well as downloadable E-Books in PDF format) of Deploying Visual FoxPro Solutions. Ship it! Music to your ears or words that cause a cold sweat as you realize you now need to deploy the solution you have worked on for so long? Have you planned the deployment? Do you have the proper language in your contract with your customer? Do you have the proper install package? Do you even know what features your installer needs or how to use one of the many installers? What media is the package going to be shipped on to the client? How will it be distributed? Is the customer even ready? What happens after Setup.exe finishes? Do you have the support infrastructure in place? How are you going to handle updates and changes? There’s a lot to think about, and deploying a solution requires careful planning. These questions and many more are answered based on real world experience within the pages of this book. 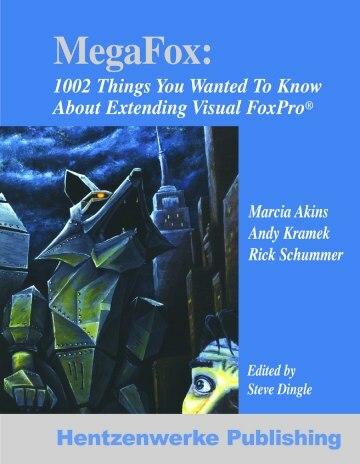 Hentzenwerke Publishing has printed copies (as well as downloadable E-Books in PDF format) of MegaFox: 1002 Things You Wanted To Know About Extending Visual FoxPro, the much anticipated follow-up book to KiloFox. This is not a second edition of KiloFox with one more tip, this is a completely new book based on the integration of VFP applications with other technologies. Answers the “How do I….” questions every programmer has about using Visual FoxPro with other programs, tools and applications. Contains hundreds of specific “how to” descriptions, each containing numerous tips and tricks. With its native data engine, rich object oriented language, and capabilities to produce COM servers and consume Web services, Visual FoxPro is the single most flexible programming tool available to a software developer. But nothing stands alone anymore. This book will show you how to extend the scope and power of Visual FoxPro as a development tool by integrating it with other software and technologies. The widely-anticipated sequel to 1001 Things You Wanted to Know About VFP (“KiloFox”), MegaFox both extends coverage of topics in that book such as data driving and reporting and introduces brand new topics such as Email, IntelliSense, Charts and Graphs, PDF Technology, SQL Server, COM/DCOM, XML/ADO, and Designing for Extensibility. Hentzenwerke Publishing has printed copies (as well as downloadable E-Books in PDF format) of 1001 Things You Wanted To Know About Visual FoxPro! The nickname for this book is "KiloFox". Special thanks to Steven Black for the nickname. 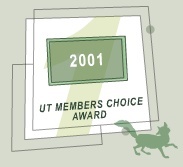 Voted "Best Visual FoxPro Book", part of Universal Thread Visual FoxPro Members Choice Awards 2001. Mike and Toni Feltman of F1 Technologies are putting on another Visual FoxExpress conference in September this year and they have invited Rick to present three sessions. Rainer Becker has announced his selection of speakers for the 12th VFP DevCon Germany 2005 held November 10-12, 2005. Rick Schummer will be presenting for the first time at this conference and for the first time outside of the USA. Sessions selection will be announced later. Other English speakers announced include Marcia Akins, Craig Bernston, Steven Black, Doug Hennig, Dan Jurden, Andy Kramek, Ken Levy, Colin and Lisa Slater Nicholls, Drew Speedie, and Rick Strahl. All the details can be found on the German DevCon Web site. There will be 37 sessions on Visual FoxPro 9.0, eight more in the VFP 9 Workshop track, 11 on SQL Server 2005, six more on .NET, and six more general topics. Bob Kocher has announced the first wave of speakers and topics for the Southwest Fox conference held October 13-16, 2005 at Arizona State University in Tempe, Arizona. Rick Schummer will be presenting "Using and Extending VFP's Data Explorer" and "Integrating Adobe Acrobat with Visual FoxPro". Other speakers announced at this time include Marcia Akins, Rick Borup, Doug Hennig, Andy Kramek, Cathy Pountney, Drew Speedie, and Rick Strahl. All the details can be found on the updated Southwest Fox Web site. "Deployment Fox 2005 World Tour"
New stops scheduled in Chicago, Kansas City, Atlanta, California, and Tempe. White Light Computing will have a booth at the second annual Southwest Fox Conference in Tempe Arizona October 13th through the 16th, 2005! Come check out our newest offerings. Check out the new Web site (www.swfox.net) for the details on this excellent fall conference for Visual FoxPro developers. New release of the Project Lister to fix a bug, add some minor enhancements, and test with new VFP 9.0 Report Designer. Rick Schummer to visit the Southern California Fox User Groups in September 2005. Guess we will call this the "Deployment Fox Tour 2005" kickoff. Rick Schummer was awarded a Microsoft Most Valuable Professional (MVP) award for the fourth consecutive year. According to Microsoft, MVPs "share the basic characteristics of possessing very strong technical skills in one or more Microsoft products or technology areas, and the willingness to share that knowledge with others". Rick Schummer is collaborating with Tamar Granor, Doug Hennig, Toni Feltman and Jim Slater on What's New In Nine: Visual FoxPro's Latest Hits from Hentzenwerke Publishing. This will be Rick's fourth book and is expected to be available when Visual FoxPro 9 is released. For more details see the Books menu option. Deploying Visual FoxPro Solutions (DeployFox) from Hentzenwerke Publishing is off to the printer and should be available around the beginning of June! Rick selected as a speaker for the DevEssentials Conference to be held June 4-7, 2004 in Kansas City, Missouri. Rick will be presenting "Debugging Essentials" and "Get More Productive with Visual FoxPro". Rick selected as a speaker for the inaugural Southwest Fox Conference. Conference is October 22-24, 2004. Sessions include "Get More Productive with Visual FoxPro" and "Creating and Using Real World Builders - Made Easy"
Free developer tool updated: see the minor fix made to RAS PrintMNX on the VFP Meta Source Code Printing Tools page. Free developer tools in process of being updated/upgraded: DBCX Compare and the DBC Showplan Analyzer. Please send me a message with any comments and/or ideas on how to improve the site and other information I can leave here on the web. Please remember, it should have some purpose! This site is designed to be viewed in 800x600 video resolution or higher, but it should work fairly well at any resolution and with any of the major browsers (all free!). Optimized for MS Internet Explorer, Firefox, and Opera (mostly works with Mozilla and Netscape Navigator).